Stuffed peppers are one of those things that I keep in my bi-weekly recipe rotation all year round. I love them because they really only take 25-30 minutes to prep, and then all I have to do is bake them around dinner time. They also contain a protein, vegetable and carb all in one, meaning that no side dishes are required...meaning less pots and pans for me to wash after all is said and done. The classic stuffed pepper contains beef, a tomato or ketchup based sauce, rice, and cheese, and while there's no arguing that those things aren't delicious, I often find its lacking depth. The key to making a dish so often without it getting old is all about variation. Try different flavor profiles, themes or even cooking methods, and you'll find it's not all so routine tasting after all. These balsamic chicken stuffed peppers are inspired by my favorite Italian deli sandwich; grilled chicken, fresh mozzarella, roasted red peppers, and a generous drizzle of balsamic glaze on warm, crusty Italian bread. 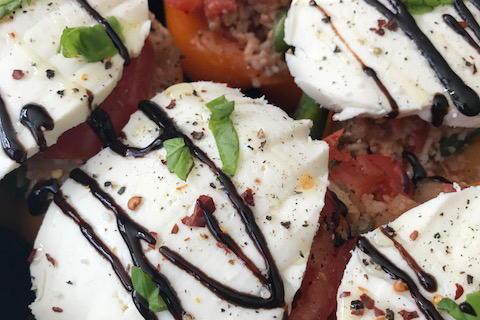 It's a ground chicken base tossed with rice, sautéed vegetables, and then finished off with a Caprese salad topping. Try this twist on a weeknight classic, and you will definitely find yourself going for seconds (maybe even thirds). Place peppers in a large sauce pot filled with water, place on high heat and bring to a gentle boil. In the meantime, in a large skillet begin to brown ground chicken. Add chopped onion and sauce all together until onion is translucent. Add in frozen green beans, tomato and sauce, ketchup, worcestershire, balsamic glaze, chopped basil, italian seasoning, salt, pepper and garlic powder and begin to simmer all together for around 5 minutes. Mixture should be glazed in sauce, add more tomato sauce or ketchup if it seems dry. Add in cooked rice, and stir in all together. Add 1 large egg, bread crumbs, and shaved parmesan and stir together until everything is combined. Once peppers have boiled for around 8-10 minutes, remove them from water and let them cool off. Slice each pepper in half, creating two “bowls” with each pepper. Stuff each half with as much chicken filling as you can, around 3/4 a cup give or take. Top each stuffed pepper with one tomato slice, followed by a thick slice of fresh mozzarella, and some more fresh basil. Drizzle peppers with olive oil, salt, pepper, crushed red pepper flakes, and balsamic glaze. Keep in fridge until ready to prepare, or bake at 350 for 45 minutes, finishing it off with a few minutes under the broiler.